Press Release – Invicta Fighting Championships has added three new bouts to Invicta FC 12 which takes place Friday, April 24 from the Municipal Auditorium in Kansas City, Mo. Joining the Modafferi-Porto fight will be two featherweight contests. New Zealand’s Faith Van Duin (4-1) will make her promotional debut against the resurgent Amanda Bell (3-2), while Peggy Morgan (3-2) returns to welcome Latoya Walker (4-0) to the promotion. Invicta FC 12 will stream live and exclusively on UFC Fight Pass. Headlining the event will be a strawweight title fight between Finland’s Katja Kankaanpää (10-1-1) and Brazil’s Livia Renata Souza (7-0). *Rankings info supplied by the Unified Women’s MMA Rankings. UFC Women’s Bantamweight Champion “Rowdy” Ronda Rousey is set to make the next defence of her title on August 1st at UFC 190: “Rousey vs Correia” in Rio de Janeiro, Brazil. Rousey meets outspoken and undefeated Brazilian contender Bethe “Pitbull” Correia in the night’s main event. UFC officials formally announced the title fight on Friday following reports from Tatame and Globo. Rousey most recently submitted “Alpha” Cat Zingano in 14 seconds at UFC 184. Correia is 2-0 against Rousey’s “Four Horsewomen” stable, with wins over Jessamyn Duke and Shayna Baszler. Rousey (11-0-0) enters the August title tilt as a massive favourite among oddsmakers, and the Olympic bronze medallist will have added motivation as she looks to avenge her fellow Horsewomen’s recent defeats. Now 5-0 inside the Octagon, Rousey has finished all but one of her UFC opponents inside the first round, with only rival Miesha “Cupcake” Tate surviving until round three. Her two most recent bouts, against Alexis “Ally-Gator” Davis and Zingano, lasted a combined time of just 30 seconds, and Rousey is regarded by some as the biggest star on the UFC’s roster today. Correia (9-0-0) began her UFC career with a close decision win over veteran Julie “Fireball” Kedzie in late 2013, but it was her 2014 campaign that made fans take note of Correia’s talents. After defeating Duke in April, Correia set her sights on the rest of the “Four Horsewomen” faction, and she handily dispatched of Baszler at UFC 177 in August. Since then, Correia has made no secret of her desire to challenge the leader of the Horsewomen, Rousey, and she will look to score a major upset when she gets her championship shot in front of a partisan crowd in Brazil. The Rousey-Correia victor is expected to move on to face the winner of a targeted June contender’s bout between the aforementioned Miesha Tate (16-5-0) and Jessica “Evil” Eye (11-2-0, 1 ND). An exact date, location and event for the Tate-Eye title eliminator has not yet been officially announced, but UFC President Dana White stated on Friday that the fight will take place sometime in June. TUF 20 semi-finalist Jessica Penne looks for her second victory inside the Octagon when she returns to action at UFC Fight Night 67 on May 30th in Goiânia, Goiás, Brazil. The former Invicta FC champion is expected to face off against veteran Brazilian contender Juliana “Ju Thai” de Lima Carneiro. Combat Press first reported on the targeted matchup today. 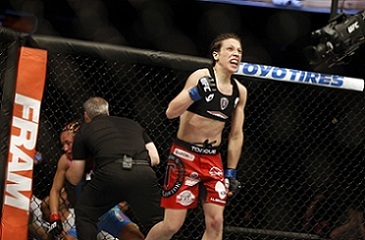 Penne won her UFC debut in December when she edged out fellow TUF 20 semi-finalist Randa “Quiet Storm” Markos. Lima bounced back from a loss in her first UFC bout by defeating Nina “The Strina” Ansaroff at UFC Fight Night 56. Undefeated striking sensation Joanna Jędrzejczyk made history tonight by becoming the UFC’s first Polish champion at UFC 185: “Pettis vs dos Anjos” in Dallas, Texas. Jędrzejczyk battered and ultimately stopped Carla “Cookie Monster” Esparza to claim the UFC Women’s Strawweight Championship. In addition to capturing UFC title gold, Jędrzejczyk also ascended to the number one spot in the 115-pound women’s division with her dominant win in the UFC 185 co-main event. Elsewhere on the card, Germaine “The Iron Lady” de Randamie picked up a key victory over Larissa Moreira Pacheco. To read the full event recap, (click here). Veteran Russian contender Julia Berezikova earned one of her biggest wins to date in a featured flyweight bout tonight at XFC International 9 in São Paulo, Brazil. Berezikova entered hostile territory and submitted Brazilian standout Juliana “Julie” Werner with an impressive second-round kneebar. In the XFCi 9 co-feature, Poliana Botelho picked up her second straight win by knocking out Antonia “Marretinha” Silvaneide da Silva to win the XFC women’s flyweight tournament. In strawweight tournament semi-final bouts, Viviane “Sucuri” Pereira and Vuokko Katainen both earned big wins tonight. Press Release – Bellator MMA remains committed to developing the top women’s featherweight division in mixed martial arts, and the latest additions to the company’s roster include Roberta “Crusher” Paim (4-0), Alexis “Sneaky Zebra” Dufresne (5-2) and Iony Razafiarison (2-0). Debut dates and opponents will be announced for all three fighters in the near future. Paim, Dufresne and Razafiarison join Arlene “Angerfist” Blencowe (5-4), Julia “The Jewell” Budd (7-2), Marloes “Rumina” Coenen (22-6), Holly “Lil Bear” Lawson (0-1) and Talita “Treta” Nogueira (6-0) on the Bellator MMA women’s featherweight roster. A native of Rio Grande do Sul, Brazil, the 5-foot-6 Paim is undefeated through the first four contests of her professional career. While comfortable in the submission game, the powerful Paim has used a strong striking game to end fights, as well. Fighting exclusively in her native country thus far, Paim has yet to find a single opponent capable of lasting past the opening round, as she has taken home first-round finishes in each of her appearances to date. The 24-year-old Dufresne is a Team Quest fighter and five-time International Brazilian Jiu-Jitsu Federation world champion. 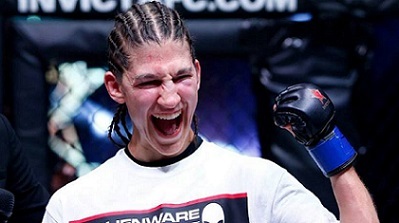 Dufresne turned her attention to mixed martial arts in 2012 and rattled off five consecutive wins to start her career – all five results coming in the opening round and averaging just under 77 seconds in length. More recently, Dufresne dropped a pair of hard-fought decisions while making a run at 135 pounds but now returns to her more natural weight class of 145 pounds for her Bellator MMA debut. Razafiarison is a French export who has notched victories in her first two professional contests. The 30-year-old Razafiarison, a grappling specialist who has trained in camps all over the world, fought most recently in January, when she earned a decision win over Sandra Ameziane. In her professional debut, Razafiarison scored a first-round submission. UFC Women’s Strawweight Champion Carla “Cookie Monster” Esparza makes the first defense of her new title on March 14th at UFC 185: “Pettis vs dos Anjos” in Dallas, Texas. Esparza battles undefeated Polish striker Joanna Jędrzejczyk in the five-round co-main event on the card. ‘Countdown’ takes us insde the camps of champion Carla Esparza and No. 1 contender Joanna Jedrzejczyk ahead of their epic title clash.